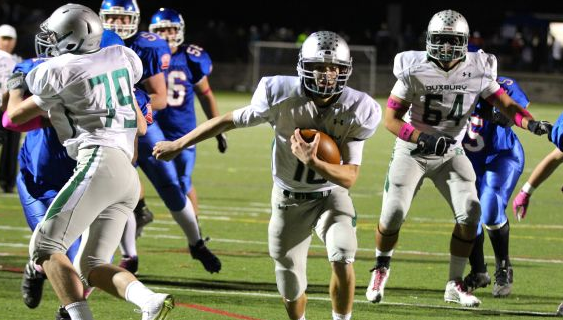 Duxbury and quarterback Bobby Maimaron continue to dominate. Photo courtesy of ESPN Boston. 1. Duxbury (6-0; Last Week – 1) Another dominant win for the Dragons in league play, as Bobby Maimaron threw five TD passes in the first half of a 52-7 win over Quincy. 2. Xaverian (5-1; Last Week – 2) Each week, the Hawks are making their narrow loss to Bridgewater-Raynham look like more and more of an aberration. They handled Malden Catholic, 35-6, last Friday and are poised for a huge conference clash against BC High in Week 7. 3. Billerica (6-0; Last Week – 3) Like Duxbury in the South, the Indians are having no trouble with the local competition. Those two teams seem to be on a collision course for the Division 2 Eastern Mass championship game. 4. Everett (4-2; Last Week – 5) The Crimson Tide rolled again last Friday, but the schedule stiffens considerably for Everett over the next few weeks with tilts against Malden, Central Catholic, Andover and Haverhill coming up. 5. St. John's Prep (4-2; Last Week – 6) Falling behind 35-0 at Everett might have been the best thing to ever happen to Brian St. Pierre’s young club. Since that resounding road loss, they upended conference rival Catholic Memorial and upset BC High at home to right the ship. 6. Haverhill (5-1; Last Week – 7) They’ve shown that they can win defensive slugfests, but in Week 5, the Hillies won a shootout by outscoring Andover 56-34 on the shoulders of stud senior running back JC Laguerre (203 rushing yards, TD). 7. Central Catholic (3-1; Last Week – 9) Bouncing back from a tough loss at Haverhill, the Raiders used a total team effort to down Lowell 49-13, as Bret Edwards spread the ball around before running back Ty Donatio sealed the win. 8. BC High (4-1; Last Week – 4) Dominant at home against Leominster and Brockton, the Eagles defense lapsed at St. John’s Prep last Saturday, and it cost them in the form of a 35-17 conference loss. 9. Wachusett (6-0; Last Week – 17) There is a new king in Central Mass. The Mountaineers spoiled Leominster’s Homecoming two weeks ago and upset St. John’s (Shrewsbury) in Week 6 to assert their regional dominance. 10. King Philip (6-0; Last Week – 10) Warriors followed their winning formula to a 36-13 victory over Attleboro and remain the class of the Hockomock league. 11. Dartmouth (6-0; Last Week – 11) No issues for Dartmouth against a D1 program in New Bedford, as the Indians impressive defense pitched another shutout. 12. St. John's (Shrewsbury) (4-2; Last Week – 8) A 25-13 home loss to Wachusett looks bad on paper, but the Pioneers were stuffed at the goal line in a one-score game before surrendering a long touchdown run to the Mountaineers in defeat. 13. Bridgewater-Raynham (4-2; Last Week – 13) The Trojans handled a Barnstable squad that’s currently rebuilding, but we’ll see if Dan Buron’s club can rekindle their upset magic with St. John’s Prep scheduled to visit this Friday. 14. Springfield Central (4-2; Last Week – 14) Is there anything more frightening than a team that is supremely talented and extremely motivated? That’s been the challenge posed to the Golden Eagles opponents, as they rolled Holyoke and Minnechaug by a combined total of 105-7 over the last two weeks. 15. Tewksbury (6-0; Last Week – 15) No trap game for the Redmen, as they took care of business against Chelmsford, but this team has to be chomping at the bit for a Homecoming Day matchup against No. 3 Billerica next Saturday. 16. Catholic Memorial (3-3; Last Week – 16) The Knights multiple offense was on full display during a 35-0 victory over Malden last Friday. They sit at .500, but all three losses have come against elite opponents. 17. Holliston (5-1; Last Week – 18) The Panthers continued to bounce back from a rare loss to Westwood a couple of weeks ago by handling Norton 28-7 behind a strong effort from their offensive line. 18. Andover (3-3; Last Week – 12) Much like Catholic Memorial in D1 South, the Golden Eagles have paid the price for playing a brutal schedule and the sledding gets no easier with a Saturday tilt coming up against Central Catholic. 19. North Attleborough (5-1; Last Week – 19) Rocketeers kept rolling with a 35-7 win at Canton. They can sew up their resume in the Hockomock Davenport Division with a win against Foxborough this Friday. 20. Marblehead (6-0; Last Week – 20) The Magicians continued to excel on both sides of the ball during a 34-16 home victory over Lynn Classical. 21. Grafton (6-0; Last Week – 21) Tantasqua Regional posed a difficult test for the Indians on paper, but Grafton had no issues during a resounding 40-12 on the road last Friday. 22. Falmouth (6-0; Last Week – 22) The Clippers took down another perennial power in the South Shore region with a 42-26 win over Scituate last Friday to remain undefeated. with a 28-26 victory in overtime last Friday. 24. Hanover (6-0; Last Week – 24) It was business as usual for Hanover during a 49-0 pasting of Pembroke in Week 6. The Indians are clearly contenders for the Division 3 South crown. 25. Natick (5-1; Last Week – 25) Despite their head-to-head loss to Wellesley, Natick’s more complete resume earns them the final spot in our rankings, but the Raiders will have a chance to change that with a huge test upcoming at Milton this week.
. "They can sow up their resume in the Hockomock Davenport Division with a win against Foxborough this Friday." You mean "sew up"? Dang, we should bring you on as an editor, haha. Good catch, I just changed it. Thanks!